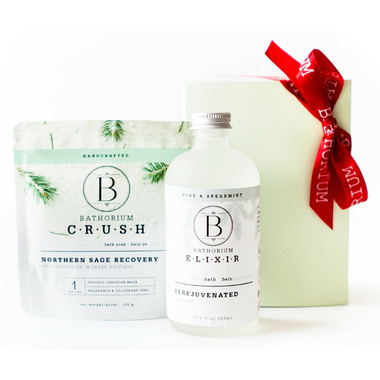 Create a soothing and healing cedarwood and fresh pine bath experience with the Bathorium Boreal Rejuvenation Gift Set. Allow the cool tingle of fresh menthol crystal envelop your entire body, while brightening sage and British Columbian glacial clay aid in muscle recovery and pull toxins from your body. 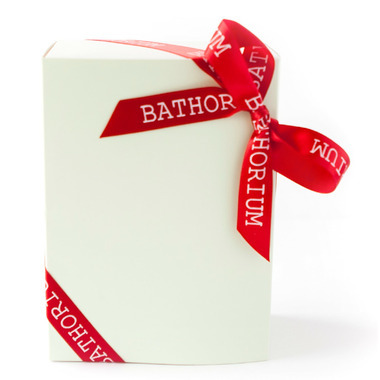 Leave the tub wrapped in the silk cloak of Abyssinian Oil, skin soft and dewy. Directions: Fill tub with warm water, optimal temperature 38° C. Add 25ml of elixir or 1 pack of bath soak under running water. Get naked. Get in. You've earned it.